Ok, first of all I big thank you to Blueatd for the tip on the html! I took me a while and it's not perfect but that's another addittion to my limited knowledge of html! Now here are the pictures I took last Sunday. 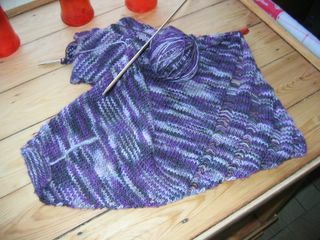 I knitted more that evening and yesterday and today so both knits have evolved past this but at least you get an idea! First of all there's the Clapotis in Lorna's Laces Lambs & Pride, in the colourway Black Purl. I love how the colours are turning out and I love how the pattern is turning out! This is one mighty hot scarf! I was laying on the couch knitting this thing and it was resting on my belly (which showed from under my top) and it was feeling so hot! Ok, it's Summer over here too so it's quite warm (even hot now) but still. I will be wearing it a lot, that's for sure! Oh, and I love dropping the stitches! I always unravel them right away. It's so much fun! Sunday evening I made ah uge mistake dropping the wrong stitch. It was too late and I should have gone to sleep sooner. So I ended up spending an hour trying to fix my mistake. Ok, true, you won't notice it's the wrong stitch I dropped, who cares, but I did. 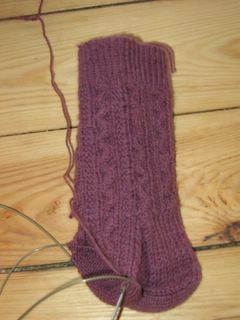 And of course I had already unravelled the stitch till the bottom before I noticed! Stupid me! But it's all fixed now! I'm already quite a bit further now. It's looking nice. 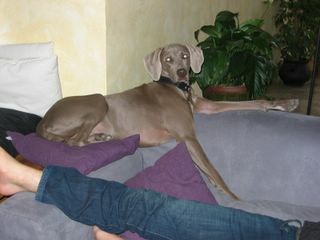 And last, our doggie is not allowed on the couch, see how she slowly moves over? She's taking over! :D Well, after I took this pic she run to me to pose for a nice picture. See the leg? That's boyfriend. I was friendly enough to cut off his ugly crooked feet. Oh, that reminds me, his socks are next on the to do list. I put them aside when he started getting angry at me for knitting to much. He's no longer angry and begging for his socks so I guess I'll take them up again! Some of you might think I'm not a true knitter for owning no cats (oh yeah, some say a true knitter has cats, but on the other hand, there are probably enough true addicts without these gracious animals). I owe 3 cats, but they hardly come inside these days and they are not fond of pics. Well, they are not fond of the dog and every time I pay to much attention to one of my cats the dog gets jealous and chases them off. :( To bad. Oh, and I'm now the proud owner of a whole set of Addi turbos! As I expected they arrived yesterday. One is of course in back order, as always the one I wanted to use for my next socks (no turbo, but an addi 2.25mm, a size not available over here as it's more US I guess). So much for now. We'll be visiting my sister tonight who's released from the hospital this afternoon (she probably already is). She's ok though in a lot of pain. Can't wait to get the sock yarn I ordered from her so at least I can give her something made with love for her next hospital visit! I'm glad it worked. Was it your photos or text which were too wide? I worked it out through trial & error. I love how your dog is just barely breaking the rules. :P My cats do the same thing when it comes to getting on the bed. LOL your dog is cracking me up! looking like "hey you don't see me here!" how do you like those Audi's?